Seven-year-old Maruska grows up in Prague in the 1950s, raised more by her relatives than her zealous, society-building mother. 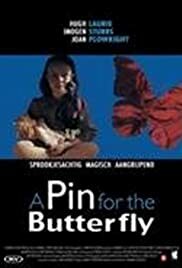 Even though A Pin for the Butterfly boasts a range of very respectable British character actors, as well as a fine plot and a densely layered atmosphere, astonishingly almost noone has seen it or heard about it. Hugh Laurie, so often a hilarious comedian, plays an unusually serious role and pulls it off quite beautifully, and the film's concentration on the innocent viewpoint of the little girl in the face of war is original and monumentally touching. It is a movie that haunts you and leaves you brooding for a long time afterwards. A magic realism pervades "A Pin..." that allows the viewer to wallow in its charm and wistful romanticism. The reality of the war, when it suddenly invades our consciousness brutally, hits us with a more than usual forceful impact that is liable to leave us stunned and raises our emotive levels. Please, if anyone ever comes across this movie (it is quite hard to track down), buy it or at least try to watch it. Films like this should not be neglected and thrown in the trash can. They are far too valuable and beautiful for that.